A soft card, stamped in Spun Sugar and Seedless Preserves Distress Inks, and watercolored with Prima Metallic Accents. It shimmers! Stamps from Altenew Layered Cupcake stamped on Bristol paper, which is whiter than watercolor paper and can handle small amounts of water. I like it! MOOD WHEN DONE: Happy to add to my birthday card stash. I'm always behind! What a sweet card! I love everything about this. What??? Is this a new coloring medium I need? Very cool metallic shimmer! I haven't tried this particular Bristol paper. Gee, do I need it, too? My mixed media vellum surface paper is very heavy -- 140 lb. Also whiter than other watercolor paper, which is nice. 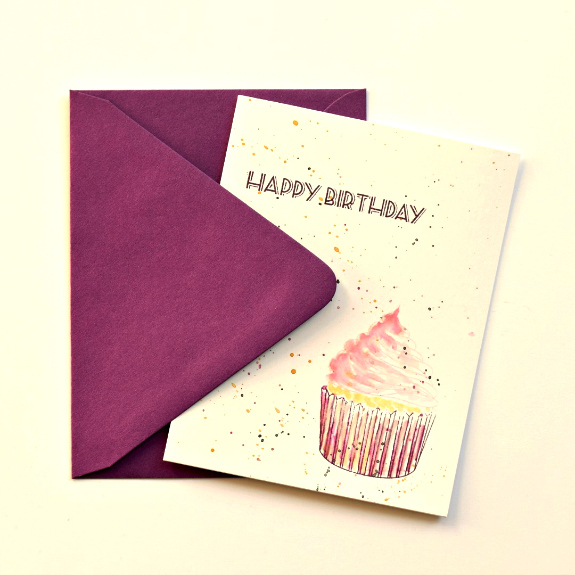 This turned out great with the no-line style and, as always, I love your card with the colored envelope. Makes all the difference!